Insurance companies that sell coverage through the state’s health insurance exchange next year will be allowed to cover fewer hospitals, doctors and prescription drugs under changes the exchange’s board approved Tuesday. It’s not yet clear whether the network and drug coverage changes will translate to lower rates, since insurance companies have not yet proposed rates for plans to sell through the marketplace in 2018. 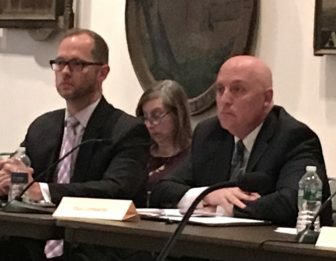 But Paul Lombardo, an actuary at the Connecticut Insurance Department, told the board that allowing insurers to cover fewer providers – and potentially negotiate lower prices with those they cover – could cut premiums by 5 to 10 percent. He also noted that health plan costs for medical services and pharmaceuticals – which take into account both price and members’ use of care – are rising by 8.5 percent to 9.5 percent. The prospect of having customers face both higher out-of-pocket costs for care and increased premiums led some board members to describe health care costs as unsustainable. While the future of the Affordable Care Act is uncertain, exchange officials are moving forward with plans for 2018 under the assumption that the current rules will stand. Wadleigh has said the two insurers that currently sell plans through the marketplace, ConnectiCare Benefits and Anthem Blue Cross and Blue Shield, have committed to submitting proposed rates for 2018 exchange plans. That’s a first step toward offering coverage on the exchange, but does not guarantee they will ultimately choose to do so. When the Affordable Care Act exchanges began offering coverage in 2014, many in other states offered plans that covered fewer hospitals and doctors than plans sold outside the marketplaces. Connecticut’s exchange, by contrast, required that exchange plans cover at least 85 percent of the providers covered by the same company’s other plans. Robert Tessier, the board’s vice chair, said officials were concerned that insurers were building their exchange networks by offering health care providers lower reimbursement rates than they were paying in their other plans, which could lead fewer to accept the plans. “We were worried about consumers actually being mandated to go out and buy health insurance, and then not being able to see providers,” he said Tuesday. How could allowing narrower networks save money? If a health plan could cover only one of two hospitals in an area, Lombardo said, it could potentially bargain for lower payment rates with the hospital it covers, since it would be sending that hospital more patients. State Healthcare Advocate Ted Doolittle said moving to narrower networks could be considered anti-consumer, but he said the insurance department’s review would offer protection, and said he supported the change because it would allow for more price pressure on health care providers. That would help to address his larger concern, he said – the need for sustainable health care costs. Board members said they wanted some assurances that the more limited provider choice would be accompanied by savings. “I think allowing the different networks is fine, as long as the customers understand what they’re buying,” said Victoria Veltri, chief health policy advisor to Lt. Gov. Nancy Wyman. During a separate discussion, Wadleigh said that focus groups indicate that many current customers are not aware of how their plans work. “They have no idea what they’re buying,” he said. The board did not discuss changes to a separate requirement on coverage of “essential community providers” such as community health centers and other facilities that people who were uninsured in the past are likely to have used for care. Wadleigh said after the meeting that he would like the board to vote next month to lower the standard. The board also voted to change the requirements for prescription drug coverage, from a broad requirement to one that would allow plans to potentially cover fewer drugs. Wadleigh said the change could lead to a 3 to 5 percent drop in premiums. The change would also be effective for 2018 and 2019. Rather than having a separate standard for the exchange, plans would instead be subject to an insurance department review that takes into account, among other things, ensuring that drug plan designs are not discriminatory. Although plans would not have to cover all drugs, the federal health law requires that health plans have an exception process that allows patients to receive coverage for medically necessary drugs that would otherwise not be covered under the plan. Regardless of what happens to premiums, exchange customers in 2018 could see higher out-of-pocket costs because of changes to plan designs the board approved Tuesday. The deductible for the standard silver plan would rise from $4,000 to $5,000 for individuals. And the cap on out-of-pocket costs for people who buy the lowest-level plan available to most customers, a standard bronze plan, would rise from $7,150 to $7,350. The plan design for the standard bronze plan with a health savings account would not change. They’re the result of having to design plans to fit within parameters required under the federal health law that dictate what percentage of members’ medical costs a plan must cover. The technical term is the “actuarial value” of a plan; the lowest-value plans allowed for most customers, known as bronze plans, must cover approximately 60 percent of members’ medical costs, leaving the patient to pay the rest. The calculator that determines those values changed for 2018, putting many of the existing plan designs out of the allowed actuarial value range. Based on the changes in the calculator, for example, the current mid-level silver plan, which is supposed to cover approximately 70 percent of costs, would be closer to 76 percent. The changes apply to standard plans that insurers are required to offer. Insurance companies can and do offer plans with unique designs as well, but most customers pick standard plans. This year, of 104,859 people enrolled as of Jan. 10, 87,593 were covered by standardized plans.